The flow plates provide a unique role in the Pleat heat exchanger, and allow for functionalities not possible with conventional plate heat exchangers. The primary task of the flow plate is to guide the flow into the titanium element, not allowing any shortcuts that reduce heat transfer. 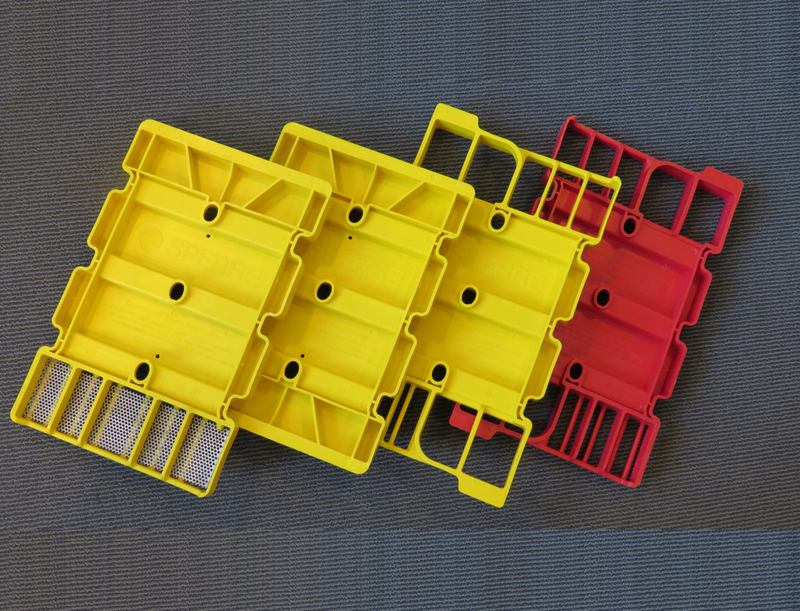 The flow plates are produced in a variety. Some of them expose the whole entry to the heat transfer element (1-pass). Others expose only half of the entry, but lead the water back to the other half after fulfilling the first pass. 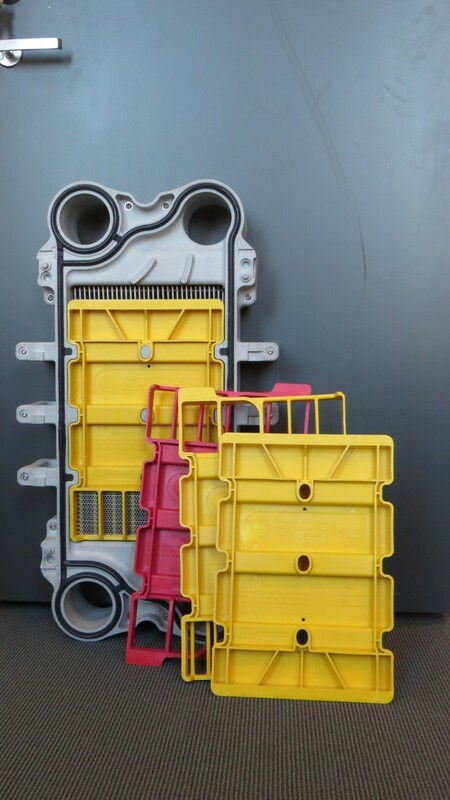 In that way, the heat exchanger geometry can be considered to be twice as long but half as wide (2-pass). For the biggest models (DN150/200), even 3-pass is available. The flow configuration is individual for each fluid side, so it is possible to have different number of passes on the two sides. This can be useful when the flows are very asymmetric on the two sides. It is not necessary to use extra steel plate to divide the plate sections into each pass. All ports are still attached to the front end plate of the heat exchanger. The latter point is important; it is no longer necessary to attach two of the ports to the rear end plate of the heat exchanger, which can be a bit troublesome, as it requires some piping flexibility due to varying torquing/length of the PHE. Another important task of the flow plate is to facilitate filtering of the water. For marine use, this is normally only done with the sea water side. Plate heat exchangers can in most cases be delivered with a perforated tube section, located on the sea water inlet within the plate packet. The Pleat heat exchanger solves this differently. A metal plate with adequate perforation is pushed sideways into the flow plate, stopping and storing particles too big to enter through the perforation. This solution provides generous filter area vs inlet port size, which can allow for increased service/cleaning interval than traditional inline filters for plate heat exchangers.